CenturyLink has deployed Infinera's DTN-X platform, featuring 500 Gbps long haul super-channels, on its nationwide fiber optic backbone. The deployment marks a significant Tier-1 win for Infinera's next gen platform. Financial terms were not disclosed. 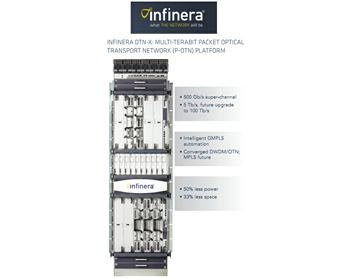 Infinera said its DTN-X platform enables CenturyLink to enhance its nationwide next generation backbone transport network to support critical video, mobile, and cloud IP services, and extend its ability to deliver up to 100 Gigabit Ethernet services (GbE) tothe company’s data centers and customer facilities around the country. The DTN-X uniquely delivers 500 Gbps FlexCoherent super-channels and integrates 5 Terabits per second (Tbps) of OTN switching per chassis. "Our experience with the Infinera DTN platform has demonstrated a system based on quality, ease of use, proven technology and reliability. As a customer since 2004, we look forward to including the DTN-X as part of our next generation network and achieving the same positive results as we have in the past," stated Matt Beal, CenturyLink senior vice president - corporate strategy, product development and chief technology officer. Telefónica will deploy the new Alcatel-Lucent 7950 Extensible Routing System (XRS) in Argentina and the Czech Republic. 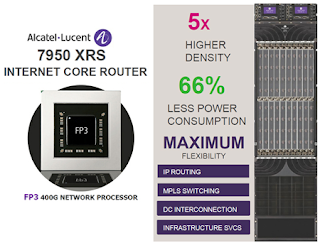 Telefónica is one the first service providers worldwide to deploy Alcatel-Lucent's new core router. Financial terms were not disclosed. The new 7950 XRS family - based on the company's 400G FP3 chipset – supports five times the density of today’s core routers and slashes power consumption by 66 percent compared to typical core routers. Telefónica also will benefit from a common operating system (SR OS) across the Alcatel-Lucent router portfolio. The solution features a common network management system – the 5620 Service Aware Manager (SAM) – offering seamless support across the 7950 XRS family and the Service Router portfolio. 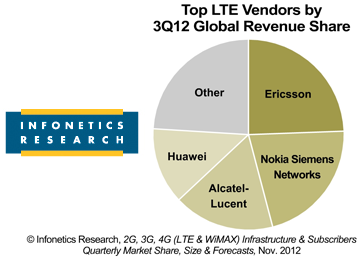 The global market for LTE infrastructure grew significantly in Q3 2012, but this was not enough to offset the overall decline in wireless equipment spending, which was down 4.7% from the previous quarter and down 4.0% from the year-ago quarter, according to Infonetics' newly released 3rd quarter 2012 2G, 3G, 4G (LTE and WiMAX) Infrastructure and Subscribers market share and forecasts report. "We saw strong LTE activity in the U.S., Japan, and South Korea in the third quarter, contrasted by weak activity in the BRIC countries, for a total 30% bump in LTE equipment sales worldwide," notes Stéphane Téral, principal analyst for mobile infrastructure and carrier economics at Infonetics Research. "LTE was indeed the lone bright spot this quarter, as the rest of the mobile infrastructure market dragged the overall market down, led by a sharp drop in CDMA gear. Despite the current lethargy, we anticipate a strong pipeline moving forward, with 2013 fully charged with a good mix of 2G, 3G, and LTE equipment purchases. China Mobile alone has a nationwide TD-LTE rollout plan of 100,000 eNodeBs." The WiMAX ecosystem is shrinking, with fewer vendors continuing to support the technology as they stake their long-term futures on LTE. 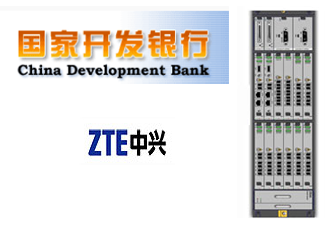 China Development Bank (CDB) will expand its financing facility for ZTE to US$20 billion. Citing the uncertain economic recovery in the United States and the debt crisis in Europe as primary factors that weaken growth in the global telecommunications market, CDB said its financial support could help ZTE achieve a stronger market position internationally. In 2005, CDB supplied an initial US$8 billion credit facility to ZTE. In 2009, the facility was increased to US$15 billion. In October 2012, despite higher revenue overall for the first nine months of 2012, ZTE reported a preliminary loss of between RMB1.65 billion and RMB1.75 billion, a reversal of between 254.42% and 263.78% compared to the same period of a year earlier. For the most recent quarter (ended 30 September 2012), ZTE's revenue decreased by approximately 13% as compared to same period last year. (4) a change in the procurement mode of domestic operators. In China, ZTE was hit by, a change in the operators’ procurement mode and the timing of their investments. In the international market, ZTE said operators slowed down their pace of investments because of a weakening global economy. ZTE's gross profit decreased significantly due to the recognition of some lower-margin contracts. In Africa, where the company was previously able to achieve higher-margin business, the overall market was undergoing a transitional stage, resulting in fewer new contracts. ZTE also acknowledged that its results were adversely affected by operations in Iran. The company noted that these operations are being investigated by the U.S. Department of Justice and U.S. Department of Commerce. ZTE's management has agreed to cut their own compensation collectively. ZTE will put profit at the center of its focus and be committed to increasing the profitability of contracts and reducing the losses of unprofitable businesses. ZTE will reduce its selling costs and research and development expenses. ZTE will eliminate offices that record losses for a long time and which have limited prospects of a turnaround. ZTE will exercise headcount control and conduct organizational change. ZTE said its new strategy calls for more resources on its terminals business in North America and Europe. The company will proactively pursue opportunities in the wireless and wired broadband segments in emerging markets including China and Asia Pacific. Speaking at the I.T.U. 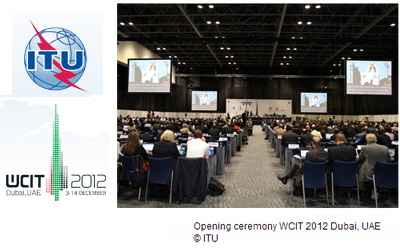 's World Conference on International Telecommunications is underway this week in Dubai to renegotiate the International Telecommunication Regulations (ITRs), a binding global treaty that facilitates global interconnection and interoperability of information and communication services. The ITRs have not been revised since 1988. ITU Secretary-General Dr Hamadoun I. Touré said the conference should not been seen as undercutting the freedom of expression. In his opening speech on Monday, Touré said "One of the most persistent myths [about WCIT-12] concerns freedom of expression, and it has been suggested that this conference might in some way act to restrict the open and free flow of information. In Article 33 of the ITU’s Constitution, however, Member States recognize the right of the public to correspond by means of the international service of public correspondence. And the ITRs cannot contradict that provision, or indeed any other article in the ITU Constitution." The U.S. government has previously stated its opposition to significant changes to the ITRs, saying that ITR should apply only to “recognized operating agencies,” which are those entities providing telecommunications services to the public, and thus preventing the treaty from expanding to include private networks, data processing and other activities. This week, Google launched a public campaign to "Keep the Internet Free and Open." 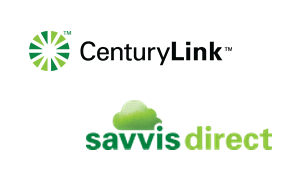 CenturyLink launched savvisdirect, a suite of cloud services aimed at businesses of all sizes. The savvisdirect portfolio includes Software-as-a-Service (SaaS) applications, on-demand virtual servers, storage services and application development platforms. CenturyLink said its strategic advantage in cloud services comes from its national fiber network and the resources of savvis, the data center and consulting company it acquired last year. "Practicality and reliability are central to the always-on and consumption-based experience of savvisdirect," said Andrew Higginbotham, president, savvisdirect. "By offering a unique, frictionless approach to cloud, our goal is to make cloud adoption – from learning to purchasing to onboarding – simple and affordable. This is a cloud every business can use." Savvis has also launched a Symphony Cloud Storage service built on the EMC Atmos platform and compatible with the EMC Atmos API framework, The company has also introduced a Symphony Cloud Storage Partner Ecosystem featuring solutions from vendors such as Riverbed, which modernizes data protection and archiving; Oxygen Cloud, which enables smart file access on mobile devices for enterprises; and Panzura, which enables storage consolidation for global network-attached storage (NAS), archive and backup use cases. Savvis' cloud storage is hosted in data centers in London, Singapore, Toronto, Washington, D.C., and Santa Clara, California. Symphony Cloud Storage complements the VMware-based Savvis Symphony suite of enterprise cloud solutions. In 2004, Savvis (formerly DiamondNet) acquired the assets of Cable & Wireless USA, which included 3,000 marquis enterprise customers, 15 data centers, and significant consulting experience from Exodus Communications, a Tier 1 backbone. Fujitsu announced a new release of its NETSMART 1500 software featuring Ethernet Service Provisioning, Traffic Engineering and Service Assurance capabilities to help network operators deploy popular MEF E-Line and new E-Access services. 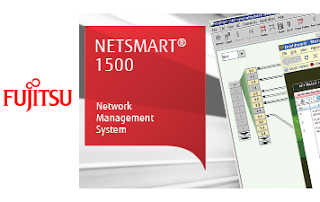 The new NETSMART 1500 software offers GUI (Graphical User Interface)-driven tools using standardized MEF (Metro Ethernet Forum) terminology. The interface enables point-and-click route selection of Connection Oriented Ethernet (COE) paths. Fujitsu said its updated software uniformly manages all layers of a packet optical network integrating SONET, SDH, ROADM and Connection Oriented Ethernet (COE) into a single network management application, allowing service providers to most efficiently manage their network resources from the photonics layer to the packet layer. The NETSMART 1500 software will implement the associated profiles for user defined bandwidth and CoS/QoS across all FLASHWAVE packet optical networking platforms, automatically accounting for the different functionality and release levels of those various elements. 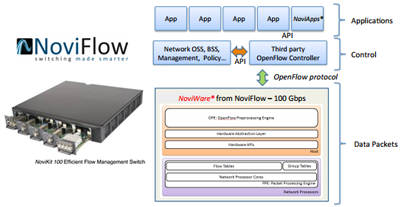 NoviFlow, a start-up based in Montreal, released a 100Gbps Open Flow 1.1 compatible switch designed to bring network virtualization and programmability to large data centers, network operators, cloud and financial service providers. A compact 1.5U box, stand-alone or rack-mounted, with modular 1 and 10 Gbps port expansion options. "OpenFlow has proven itself in real-world SDN deployments by leading companies such as Google. Now, we’re giving OpenFlow a high-performance boost,” said Dominique Jodoin, President and CEO of NoviFlow Inc. “General purpose CPUs are great for many applications, but today’s major data center operators demand switching solutions with genuine wire-speed performance. At NoviFlow, we combine the benefits of virtualization and programmability with processors that can handle complex network flows to make it possible for data centers to keep up with today’s exponentially growing networking demand." 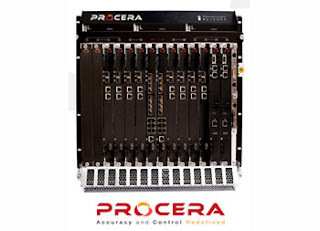 King Saud University (KSU) has deployed Procera Networks' PacketLogic platform for network traffic management and user awareness. The university has over 100,000 students and nearly 10,000 faculty members. The school, which boasts one of the most advanced campus networks in the region, has seen packet traffic grow by more than 50% year-over-year. This creates a strong need for real-time granular traffic visibility, reporting, and bandwidth management.